Trekking in the bush with Samburu guides, English speaking, who will keep you entertained with local stories and culture, you spend four nights in the bush, changing camp sites each night. Leaving Nairobi on day 01, you are transferred to Maralal, here you will spend the night in our self contained Bandas. In the morning you set out after breakfast on your camel trek. Trekking in the bush with Samburu guides, English speaking, who will keep you entertained with local stories and culture, you spend four nights in the bush, changing camp sites each night, with a support vehicle moving the camp each day. Your last night at Yare Club [Sunday] is in our self contained Bandas once more, a Samburu dance is included, and on Monday you join the Turkana truck. Specially designed with high sides, the vehicle is equipped for the rough terrain you will pass over. Camping is at camp sites and in the bush, depending 011 our location. All camp equipment is provided [except sleeping bags], and our cook will keep you well fed throughout the safari. After breakfast you set off through the bush and Maralal game sanctuary. It should be remembered that this is not primarily a game viewing safari, but you never know what you might bump into! After a hot breakfast you set off through the bush. 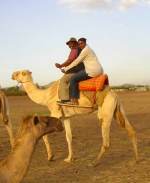 You may ride or walk, the gait is slow and the camels can allow you to change whenever you wish. Mattresses pad the locally made wooden frames 011 your camel. The pace is relaxed and there is plenty of time to study the environment and mke pictures as you move along. Ther are only a few places where you might be forced to dismount due to washed out luggers and river beds. The camels axe led by Samburu Morons who will keep you informed of what you are seeing and of the culture of the people you may meet. On your arrival at camp a shower waits you [water permitting] and your cook will have afternoon tea and snacks ready for you. Later in the afternoon you may choose to go on a nature walk with your Moran guides. Usually returning to our Club about mid day, you are free to explore Maralal town after lunch, or just relax around the Club. If you choose to visit the town, your Moran guides will accompany you to add to the experience. Before dusk the Sambum Morans and ladies will dance for you at the Club, before dinner and overnight in OUI Bandas. Crossing the Alberta Plains, we descend to the \'Jade Sea, Lake Turkana. Private Camp site [approx. 5 hours]. A trip to E1 Molo Bay, here we visit the smallest tribe in Africa. At leisure at Loiyangalani. Swimming pool and cold beers available at \'Oasis Lodge\' - at cost!. This is the toughest days ride and bush camp of the safari. Crossing the Kaisut desert, we head throug.i1 the Matthew\'s mountains into the Wamba area. Bush camp. [approx. 10 hours]. Samburu Reserve. We drive to Samburu Buffalo Springs camp. The day is spent game viewing in the Reserve. Elephants abound; you should see lion, reticulated Giraffe, Gerenuk, Grevey\'s Zebra and Oryx. We camp within the Reserve. .
After breakfast, we pass Mt. Kenya, climbing past the foothills of the mountain and across the Equator. Picnic lunch, returning to Nairobi late afternoon.